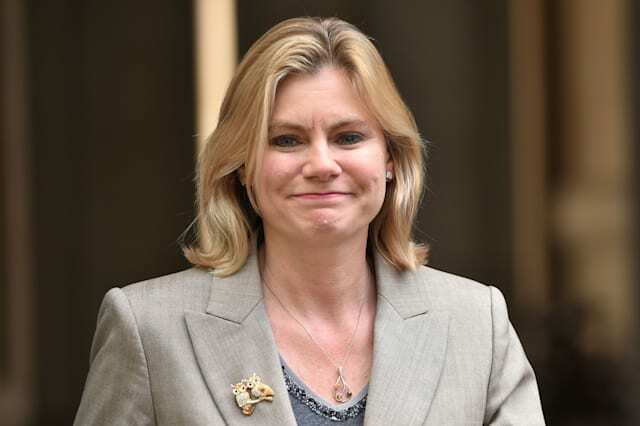 The Conservatives share the values of young people, Justine Greening has said, as she suggested her party should be listening to first-time voters. The Education Secretary insisted the Tories will offer the younger generation "a real choice", and that they are the party of aspiration and equality. Her comments come in the wake of a surge in support for Labour leader Jeremy Corbyn among young voters in last month's General Election, in which the Conservatives were left without an overall majority. In a speech to a conference on social mobility, Ms Greening said: "I want to make the path of today's generation of young people a much smoother one than the one that I had when I was a young person. "I do think this is a cross-party agenda but I will say this, first and foremost, above all, my party is nothing if it's not a party of aspiration, of equality of opportunity, and of putting together a country where effort really does lead to reward. "I believe that we should be listening to the voices of a new generation of voters who joined our democracy last month. "My message to them would be that actually, your values are our values, whatever you've been told, and I represent a very young community. "And I believe that democracy is about choice and we are going to make sure that young people get a real choice at the next election." Ms Greening, who held on to her seat, Putney, Roehampton and Southfields with a majority of 1,554, also insisted that the current higher education system, in which students pay up to £9,250 a year in tuition fees and there is no cap on student numbers, means that disadvantaged youngsters get the chance to go to university. A cap on numbers means that less students get the chance to study for a degree, she said, and those that win places are more likely to be those from better-off families. The future of tuition fees has come under the spotlight in recent weeks following a Labour manifesto pledge to axe the charges. In addition, Mr Corbyn suggested towards the end of the General Election campaign that he wanted to think about wiping out the current student debt. But Ms Greening said: "I really do feel the Labour Party should come clean to young people and be upfront with them about the consequences of its no fees policy. "I also think they should be frank with young people that what they said in the run up to the election about effectively writing off student debt was a false promise." At the weekend, shadow education secretary Angela Rayner said Labour will not make an announcement on wiping out the current student debt "unless we can afford to do that".